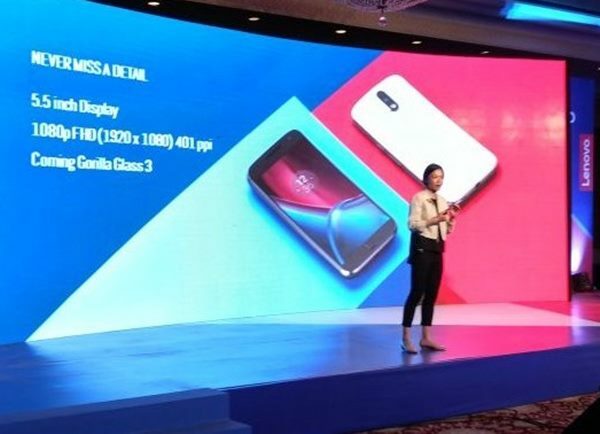 Lenovo owned Motorola launched two smartphone, Motorola Moto G4 Plus and Moto G4 in Indian market. Motorola Moto G4 Plus launched at 13,499 for 2GB RAM+ 16GB ROM and Rs. 14,999 for 3GB RAM + 32GB ROM. It’s available through Amazon from Tuesday. However Lenovo hasn’t confirmed the pricing and availability Moto G4 which will launch in 9th June priced approx. Approx. Rs 12,999 for 16GB and approx. Rs 13,999 for 32GB. The all new Motorola Moto G4 Plus comes with a full metallic body support Finger print Scanner, dual-SIM(Micro+Micro), Finger Print Scanner, USB OTG, 4GLTE, NFC, Wi-fI, Bluetooth come with a bigger 5.5-inch Full HD 2D glass display with resolution (1080×1920 pixels), 401 pixels per inch and gorilla glass 3 protection and full GFF lamination . Motorola Moto G4 Plus is powered by a powerful 1.5GHz, Qualcomm Snapdragon 617processor, Adreno 405 GPU with 2GB/3GB RAM, 16GB/32GB ROM and 128GB MicroSD card slot. It runs on most advance on Android 6.0 Marshmallow OS. Motorola Moto G4 Plus sporting a 16-MP rear camera with f/2.2 aperture and dual-LED flash and Sony CMOS sensors(Sony IMX230 with zero shutter lag), 4k Video recording, 6P Lens, f/2.0 aperture, PDAF (phase detection autofocus) and 5-mp front camera for video calling and selfies will powered by a powerful 3,00mAh battery with sophisticated power management technology and TurboCharger.. It measures 153×76.6×9.8mm and weight is 155gm. The all new Motorola Moto G4 comes with a full metallic body support dual-SIM(Micro+Micro), USB OTG, 4GLTE, NFC, Wi-fI, Bluetooth come with a bigger 5.5-inch Full HD 2D glass display with resolution (1080×1920 pixels), 401 pixels per inch and gorilla glass 3 protection and full GFF lamination . Motorola Moto G4 is powered by a powerful 1.5GHz, Qualcomm Snapdragon 617processor, Adreno 405 GPU with 2GB/3GB RAM, 16GB/32GB ROM and 128GB MicroSD card slot. It runs on most advance on Android 6.0 Marshmallow OS. Motorola Moto G4 sporting a 13-MP rear camera with f/2.2 aperture and dual-LED flash and Sony CMOS sensors(Sony IMX230 with zero shutter lag), 4k Video recording, 6P Lens, f/2.0 aperture, PDAF (phase detection autofocus) and 5-mp front camera for video calling and selfies will powered by a powerful 3,00mAh battery with sophisticated power management technology and TurboCharger.. It measures 153×76.6×9.8mm and weight is 155gm but no Finger print Scanner. Moto G4 and Moto G4 Plus are almost identical to each other but Moto G4 missing Finger print scanner and comes with a 13-MP rear camera in place of 16-MP camera. At last few honest word, Motorola Moto G4 and Moto G4 Plus going to win the hearts of Indians. What you think? Please be open to give your view.